Opening Harper’s Cook Book Encyclopedia proved more than serendipitous. 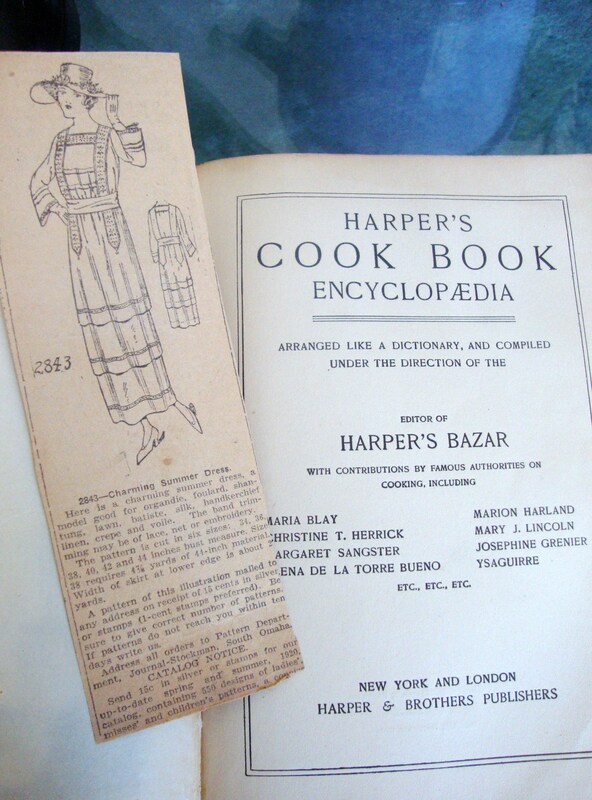 The volume is an exhaustive compendium of turn-of-the-20th-century recipes and preparations, but a previous owner had also used her trusted book to file away newspaper clippings for spring fashions, household hints, and some favorite “Why Mothers Get Grey” cartoons. Busts and statuettes may be cleaned by dipping them into a thick liquid of starch, or apply a thin solution with a brush, covering every part. Let it dry two or three days. Then carefully peel off the starch. The dirt will come with it. Somehow I’d never thought about springcleaning for the plaster, or ebonizing the woodwork, but Caroline has the answers. The Harper’s Cook Book is a marvelous glimpse into life, both everyday and aspirational in the first decade or so of the past century. And a reminder of how much lifestyles and eating habits have changed in the past 100 years. There are lots of items that really don’t grace our tables anymore: mutton, aspic, violet jelly. And also recipes for “exotic” fruits and vegetables that are so commonplace today we rarely give them a second thought, like Banana Salad. It could just be me, but this recipe sounds a tad racy. Maybe that’s why the owner had page 327 bookmarked. A strip of the peel of a large and perfect banana may be turned back, and most of the pulp carefully scooped out. The short, thick variety of banana, in either red or yellow, is best for this purpose. To fill the space left by the removal of the pulp, prepare a mixture of thinly sliced banana, shredded orange or grapefruit, seeded and peeled white grapes, and a few kernels of English walnuts or pecans in small pieces. In their season, stoned cherries may be added. All must first be mixed in a bowl with a generous supply of dressing, and after the yellow cases are filled with the salad, each must be laid on lettuce leaves. These, like the apples, must be prepared in a short time before using. Either a mayonnaise or a good boiled dressing may be used. To four well-beaten eggs, stir a pint of vinegar, two teaspoonfuls of sugar, a teaspoonful of mustard, salt and paprika to taste. Turn all the ingredients into an agate or porcelain-lined saucepan and stir over the fire until the boiling point is reached. Add two teaspoonfuls of butter, and beat until it is thoroughly incorporated. When cold, turn into a preserve jar and set in the refrigerator. The result? Quite honestly, I wasn’t expecting much from this recipe, but it turns out to be a nicely balanced and unexpectedly refreshing salad. Something I’d not think of making but might manage to work into the repertoire, sans the banana boat presentation. Same goes for the boiled salad dressing. It’s not an idea that leaps to mind, but it has a smooth texture and bright acidity that plays off the sweetness of fruit. Thanks, Harper’s!